What would have been a perfect ending to a historic and majestic season was not meant to be, as the University of Chicago women’s soccer team failed to capture what would’ve been their first NCAA DIII Championship, after a close yet devastating loss to No. 6 Williams, which saw both teams neck and neck with each other from the start of the whistle. Getting to the finals meant UChicago had to get past one of the biggest roadblocks they’ve faced, in the form of No. 1 TCNJ. However, it didn’t faze the Maroons, who didn’t hesitate in attacking, starting with fourth-year Madori Spiker, who attempted a shot just 16 seconds into the game. Past the five-minute mark, Spiker was able to center the ball to second-year Hanna Watkins, who sent it in the right side of the net. Despite the fact that no more goals were scored in the match, both sides increased the pressure, despite fatigue setting in. Fourth-year Caroline Olivero would strike and send a ball to hit the post and then the keepers back, sending it outside. Desperate to score a goal, the Lions created play after play, only to have their passes broken up by the UChicago defense, who stepped up and emphasized the fact that no one was going to come inside their box. Twenty minutes into the match, first-year Miranda Malone would come in for second-year keeper Katie Donovan, who left with an injury. Malone made two crucial saves, including a 1v1 situation, using her awareness to not allow a shot, and time for fourth-year Whitley Cargile to hustle and launch the ball out. It was a match where the Lions led in shots (12–9) and corners (7–3). However, Watkins’s goal would allow the Maroons to compete for a national championship for just the second time since 2003. In an atmosphere that was electric, the University of Chicago women’s soccer team came to the NCAA Championship game looking to give everything they had. It was a hard-fought battle that went scoreless into the half. Williams would test the Maroons with pressure early on, with two saves made by Katie Donovan. Spiker and third-year Jenna McKinney would have opportunities in the box, but the Ephs’ keeper thwarted those attempts. She would go on to stop three breakaways throughout the match. 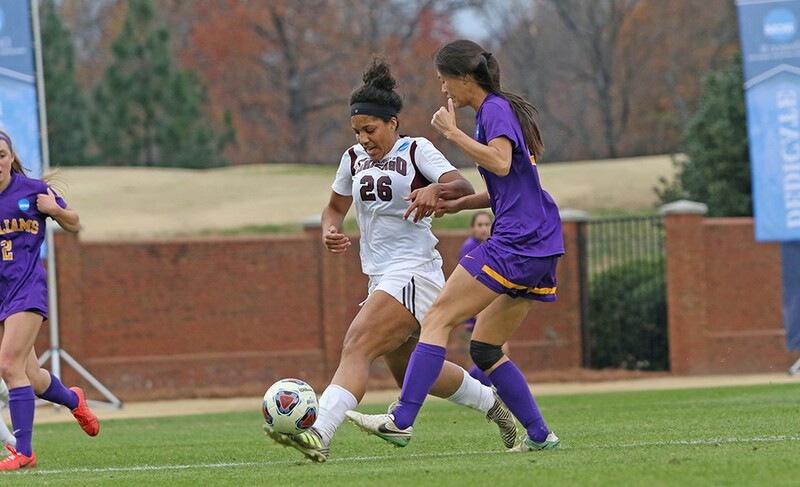 As the second half rolled on, Williams would find the back of the net when two Ephs moved the ball past two Maroons and found an open forward who chipped it in. The Maroons were relentless on the offensive end, however, having had absolute control of the ball in the final 20 minutes. Looking to score, their best chance in the final minutes came when Watkins’s left-footed shot nearly hit the post. Despite UChicago having 14 shots as opposed to their opponents’ 12 shots, it wasn’t enough. If you aren’t winning, you’re learning. There is no doubt that the Maroons will take this experience to work harder and further motivate themselves next season as they strive for greatness.